Making social protection more nutrition sensitive: why should we care? 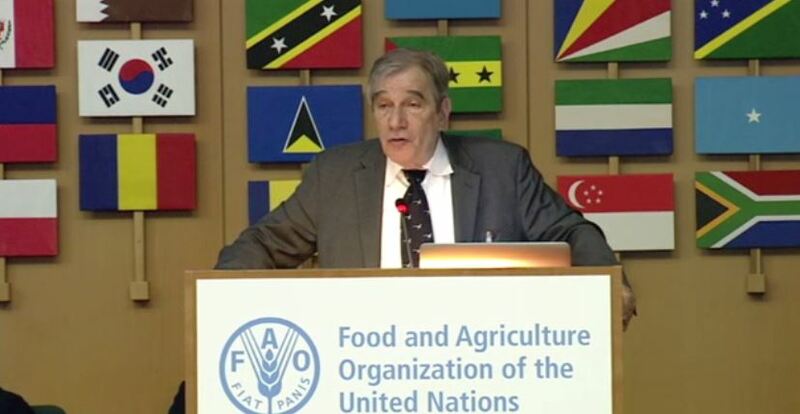 Harold Alderman, IFPRI’s Senior Research Fellow whose research on linkages between social protection and nutrition PIM supports, gave an overview presentation titled ‘Making social protection more nutrition sensitive’ at the FAO/WHO International Symposium on Sustainable Food Systems for Healthy Diets and Improved Nutrition that took place at the FAO Headquarters in Rome on December 1-2. In his opening remarks to the Parallel session 2.3 Increasing access to healthy diets through social protection and income generation strategies, Dr. Alderman reminded participants about the 2013 Lancet series of the 10 best studies of nutrition specific interventions with proven results. The journal found that if these interventions were all scaled up to reach 90% of the at risk population, it would reduce stunting globally by 20%. This is, obviously, not enough. If we want to go beyond that and reach the nutrition related SDG targets, said Alderman, we need to address the underlying causes of malnutrition, and that is where nutrition sensitive social protection, nutrition sensitive agriculture, and solving water and sanitation problems are key. Click here to watch the webcast of Harold Alderman's presentation. While commitment or enabling environment barriers are still high, there are also other challenges. The need to understand how best to help children in emergencies (and make relief efforts more nutrition sensitive), for example, is largely about the need for field research. But many of the gaps in making social protection more nutrition sensitive are about putting what is already known into practice, concluded Alderman.